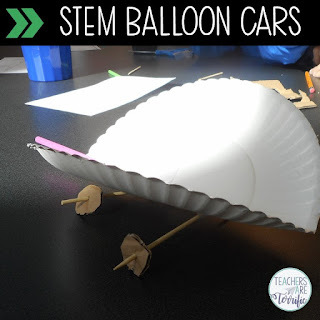 Are you ready for a very exciting STEM Challenge? Actually, that's a statement that can be true of all STEM Challenges! This one has a unique quality and a competitive component. Hold onto your hats! The first time we tried this challenge the kids were quite aghast at the lack of materials available! They have a small selection of items and they must build a car that rolls and travels forward- hopefully in a straight line. The problems they encounter are met with a fabulous diligence because ultimately they want the cars to perform. The promise of races with other teams makes them work really hard! We have built a good variety of cars in our class. The biggest problem we encounter with every car is that axle. The idea that a car must roll leads kids to try to make wheels that roll. They want the axle to stay stationary. This can work and I have seen teams pull it off, but what really does work better is stationary wheels and a turning axle. I have some toy cars that I display so kids can think about how a real car works. The wheels roll because the axle turns. In the photo above you can see the best way to make this happen. Use a straw with a wooden stick running through it. The straw is attached to the body of the car. The wheels are placed on the stick and they roll! This, of course, is something the kids have to discover. They will try many things before they try this simple trick. PROBLEM: we use shish-ka-bob sticks for this. Before you use that kind of wooden stick snap the pointed tips off of them! Again, we have built a lot of little cars. Most of them are built of cardboard and the kids make a box. For this challenge one of the materials is a paper plate. The cars made from this unique material are almost always shaped like burritos or tacos, but this year I had some that looked more like a box. And maybe, even a food box! The box-shaped one in the photo above actually looked like a hot dog container that you might get at the ballpark. Making wheels is another dilemma we run into whenever we make a car. I discovered a long time ago that making round objects and then cutting them out nicely is a challenge for kids! Take a look at the wheels in the photo above. They are not exactly round and this will definitely keep them from rolling! PROBLEM: It's hard to cut out those wheels! Because I know this I will usually cut out wheels for my younger students (3rd grade), but the older ones are on their own. Here's what I see sometimes: There will be one student in the class that is an expert circle cutter and every team will talk that student into cutting out their wheels! Look at all the wheels and axles in the photo above! Now, let's see if we can make those cars move. Each group has several balloons and they must determine a way to attach them and still be able to blow them up. And, the balloon has to stay attached when it is released. The group above tried a double set thinking this would make it go faster and farther! What do you think happened? Every year I have groups that add their own flair to this challenge. This year was exceptional. Below you can see the Pizza Car, a cone-shaped car, the open taco car, and a couple of box-shaped cars. This challenge is challenging, but it is one that will work. 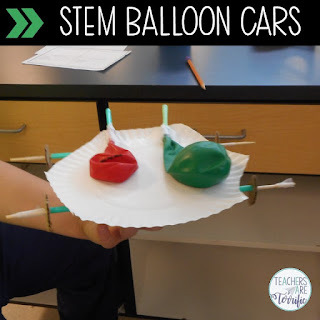 Kids will stick with this one and make those balloon cars race around. Sometimes they will only travel in a circle and sometimes there will be enough that work successfully so we can have races! Watch our video! 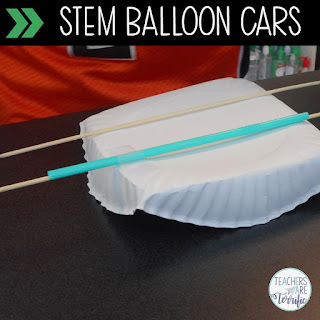 Balloon Cars are a quick challenge with only a few materials and one that kids will love! Perfect for a lively Friday afternoon! You will have a BLAST!